Facebook Dynamic ads let online businesses re-target people who have browsed or already purchased from their store. To summarize the concept, you upload a selected product catalog to Facebook, then build target audiences and filter your products to the most relevant consumers you want to reach. In fact, we're such a fan of Facebook Dynamic ads we published a 3-part series earlier this year, you can read the first one right here! What are product sets on Facebook? However, the options in the table might not be what you're looking for. In this case you can use an extra filtering options called Custom Labels. Custom labels are 5 optional, additional columns that can be added to your product catalog. You might already be familiar with the concept of custom labels from Google. These label's value can be anything of your choosing, numerical or text. Some examples might include seasonality, clearance, year of release or name of a specific promotion for certain products. The most efficient and straightforward way to add Custom Labels is straight to your product feed. The other option is to use Facebook's Data Feed Rules in their Business Manager. This is intended more for setting up solutions to fix small issues during import of your data. So to effectively set up your custom labels, the best option which doesn't rely on external developers, is to use a data feed management tool. How can Custom Labels Improve the performance of your Facebook Dynamic Ad campaigns? Let's take an example from one of our clients who we are continuing to work with and deliver results. They are a costume supplier, selling thousands of varied products worldwide. The costumes' important product attributes might include factors like title, description, size, material, gender and seasonality (which event it is used for, e.g. Halloween, Christmas, etc). 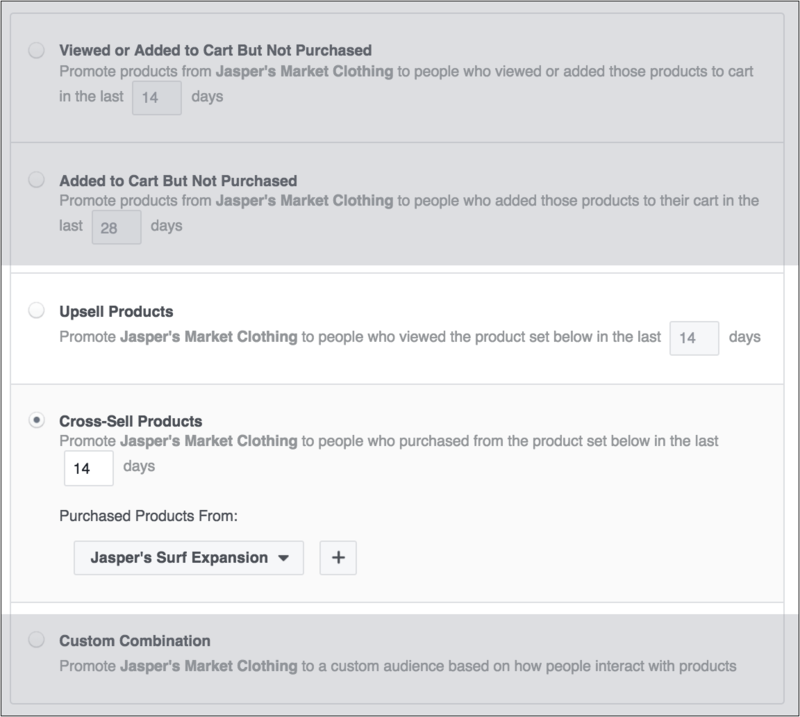 Now, if we look back at the table above - your Facebook Product Catalog will let you input title and description for your products - but not other factors like seasonality. If you are familiar with custom labels for Google Shopping you will already know how useful they can be for segmenting your feed. You can allocate different budgets to different sets. In our example of a costume supplier this might mean setting up seasonal labels which you can then bid more on when it comes to their time of the year. E.g In October's approach to Halloween you can start bidding more and allocating more budget to your Halloween-related products in Custom Label-0. The result? You are pushing relevant products at the right time (to the right audience) so you know your dynamic ads are more likely to yield results. 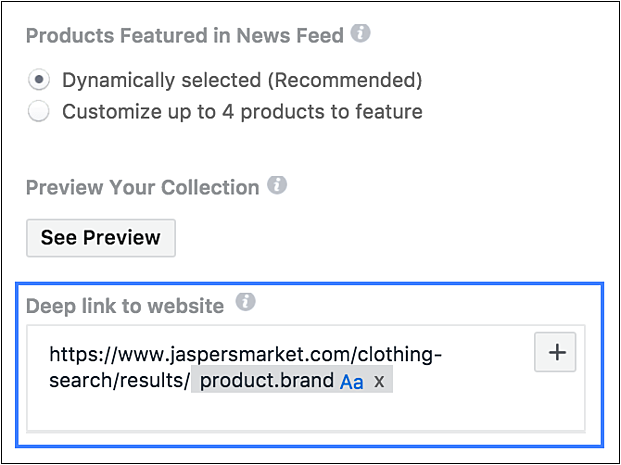 You probably already know that Facebook Dynamic Ads lets you display certain product sets to an audience who have already engaged in some way with another set of your products. Both these options are useful for increasing the lifetime value of a customer, as they may be out of the costume market immediately after making a purchase for Oktoberfest, but could still be interested in costumes from your brand when it comes to Halloween. The intent of audience members when browsing your products. Which items could be complementary to cross-sell after a customer purchases a product? One feature of collection and dynamic ads are deep links. These send people to a specific page on your online store, and can have tracking parameters added to give further insights and track every click. Your custom labels can easily be added to the end of your URL, as in the screenshot below. This example has added product brand as a parameter, but we could just as easily add one of our custom labels here. The advantage of doing this is the access you will get to granular reports. Every product set you have set up will be assigned to a specific ad set, meaning you will be able to see the performances of your ad sets from within your Ads Manager account. In this article we've shown that custom labels are an extremely effective tool with multiple possibilities to optimize campaigns to increase ROAS and conversions. We've outlined just a few of the ways that custom labels for your Facebook Dynamic Ad campaigns could be implemented to improve performance - but there are many more. Reach out to us if you want to get more info. You can hear how we used effective Google Shopping custom labels for our client, Festmagasinet, in order to increase impressions by 168%, clicks by 20% and conversions by 3% in a 12-month period.